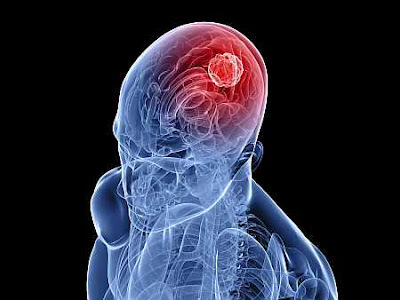 The hardest tumor to remove is a brain tumor. Some tumors look like part of the brain itself. To help identify the difference between tumors and healthy tissue and improve tumor resection, Doctor Andrew Sloan, Director of the Brain Tumor and Neuro-Oncology Center at UH Seidman Cancer Center, is testing an experimental drug called 5-Aminolevulinic Acid (5-ALA). The drug makes brain tumor cells glow hot pink when illuminated with a special blue light incorporated into an operating microscope. The blue light helps to identify and remove tumor cells in a process called Fluorescent Guided Resection (FGR). This is unlike Photodynamic Therapy (PDT) where light is used to remove the tumor. FGR, on the other hand, helps the surgeon identify the tumor. This process helps surgeons operating on the brain cancer to visualize the form of the tumor and see its edges more clearly. This allows them a more complete removal from the brain. 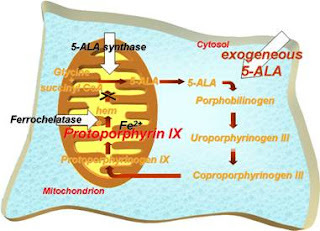 5-ALA is taken orally prior to surgery and also during the operation. Compared to a person's normal tissue, high-grade gliomas (brain tumors) metabolize 5-ALA to protoporphyrin ix, a fluorescent compound that is similar in structure to that of chlorophyll found in plants. Tumors that absorb this compound glow with the blue light. Using a specially modified surgical microscope that contains the light, it enables the surgeon to see the glowing tumor tissue and help guide in removing the tumor. Video: Dr. Sloan discusses 5-ALA and shows Fluorescent Guided Resection (FGR) in action. 5-Aminolevulinic Acid is not yet approved by the FDA in the United States although it is already used for FGR cancer treatment in Europe. UH Case Medical Center is one of the few hospitals studying the drug in the U.S. for brain tumor surgery. Dr. Sloan is collaborating with David Dean, PhD, Associate Professor and Director of the Imaging Laboratory in the Department of Neurological Surgery at Case Western Reserve University. They are finding ways to improve how Fluorescent Guided Resection by precisely measuring protoporphyrin ix fluorescence in tumors using a digital fiber-optic probe during surgery. They believe that the digital probe will be both more sensitive and more precise than the current technique which is based on the surgeon's perception of how "pink" the tumor is.